The main stem of the Saugatuck River runs from Ridgefield through Redding, Weston and Westport where it empties into Long Island Sound. Along the way it becomes larger as two main tributaries, the West Branch of the Saugatuck River and the Aspetuck River, enter the main branch. The Saugatuck River ranges in size from a stream roughly 10-feet wide near the headwaters, to a much larger river as it draws closer to the Sound. Additionally, the Saugatuck River is part of a drinking water supply reservoir system, with a large section of the reservoir which can be fished from shore, but is difficult to fish with a fly rod. There are all types of water to be fished in the Saugatuck River, including pocket water and riffles, deep gorge pools below the reservoir, and large expanses of calm water where dry fly fishing can be excellent. 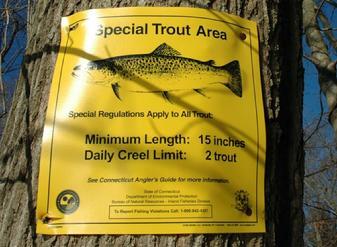 The Saugatuck River and its tributaries are stocked by the state, and in addition to the stocked fish, anglers in the river sections can often catch brown trout which have come down over the dam after gorging on baitfish and becoming quite large, and also, increasing numbers of searun brown trout which come up the river to spawn each fall. Walleye can also be caught just below the reservoir, and are typically washed over in high water conditions in the spring and fall. 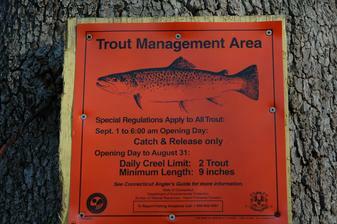 The most popular place to fish the Saugatuck River's main stem is in the William "Doc" Skerlick Trout Management Area off Ford Road in Westport. 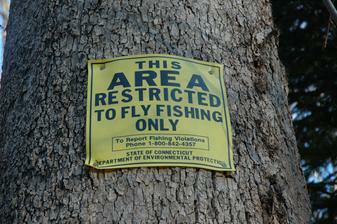 Like the Mianus River TMA, the Saugatuck TMA is a limited harvest section of the stream, but unlike the Mianus River, the Saugatuck River TMA is reserved for fly fishing only, with no bait or spin rods allowed. 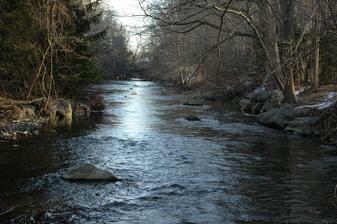 The TMA runs from the dam near the head of Ford Road downstream to the Merritt Parkway overpass. For this section, a longer rod is suitable, as there are wide open places to cast. A 9-foot, 4- or 5-weight works well. Above the TMA, the Saugatuck River becomes smaller and runs mainly through private residential property, making access to the stream more difficult. There are places along this stretch, at road crossings and in public parks such as Keene Park in Weston, which offer access. In these sections, a 9-foot rod is functional, but a shorter rod is optimal. Just below the dam, in the gorge area off Valley Forge Road, a 9-foot, 5-weight is best, and sinking head fly line is suggested, as there are deep pools and fast moving water. As the river heads towards the Sound, it enters a tidal estuary. In this section of river in Westport, anglers often fish by boat or kayak, though limited wade fishing is possible in the upper stretches of the estuary. At the head of the estuary is a small dam and fish ladder. Here it is possible to wade fish for searun brown trout and stocked trout which have moved downstream from the TMA. Anglers occassionally catch striped bass and small bluefish here as well. 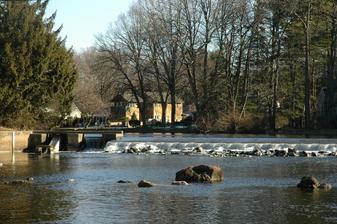 To get to the Saugatuck River's main stem and the TMA, take the Merritt Parkway to Exit 42, for Lyons Plains Road. Take a right at the exit. Take a left onto Ford Road at the first traffic light and continue down Ford Road until you see the well-worn pulloff areas right next to the stream. Do not park in the lot across the bridge, as that parking lot is private and the gate is locked each evening. The West Branch of the Saugatuck River is off Newtown Turnpike along the Wilton/Weston town line. The Aspetuck Land Trust property is located along Newtown Turnpike, just past Stonebridge Road in Wilton.